Secretary of State Rex Tillerson called reports he's being replaced "laughable." Secretary of State Rex Tillerson doesn't seem to be sweating the reports of his imminent ouster. 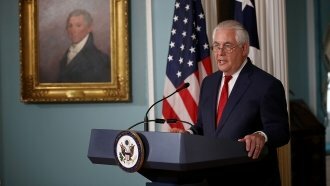 When questioned about those reports, Tillerson said: "It's laughable. Laughable." The New York Times first reported that the White House was drafting a plan to force Tillerson out of the U.S. State Department and replace him with current CIA Director Mike Pompeo. But President Trump later attacked that report on Twitter, insisting that "while we disagree on certain subjects ... we work well together." Tillerson most recently had to bat down rumors about his resignation in October, following a report that he had privately questioned Trump's intelligence.